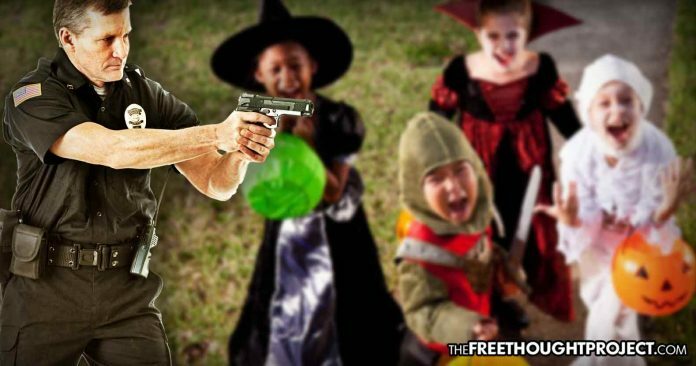 Tyrannical local laws threaten fines and even jail time for kids going trick-or-treating past a certain time or older than a certain age. In the land of the free, trick-or-treating outside of the guidelines for the proper city ordinance can and will get you charged with a crime, extorted, and even thrown in jail—including children. While towns across the United States have ordinances laid out to establish times for trick-or-treating, in Virginia, these laws go to the extreme. As kids await one of the best days of the year for candy lovers, those in Virginia have to navigate an insanely strict set of rules or risk prison time—seriously. Several Virginia towns in the Hampton Roads area of the state have laid out guidelines for trick-or-treating that if violated can end in jail time for the offender. In Chesapeake, Virginia, the law states that anyone over the age of 12 who attempts to go trick-or-treating will face fines, jail time, or both. But that is not all. It’s not only 13-year-old kids and older who are threatened with jail for trick-or-treating outside of these guidelines. If a 12-year-old or younger kid knocks on a door after 8:00 p.m. and mutters the words “trick-or-treat,” they can also be fined or jailed. Chesapeake isn’t alone either. In Newport News, Norfolk, Portsmouth, and Suffolk, Virginia it is also illegal to be out past 8:00 p.m. and be older than 12. If violators are caught, however, the Class 4 misdemeanor charges only comes with a fine. If your birthday comes too early in the year, as the rest of the 6th graders head out to snag handfuls of high-fructose corn syrup laden goodies, you’ll have to stay at home or risk spending the next 6 months in jail. Seriously. Imagine being the 6th grader who comes to school the next day and when he or she is asked why they have no candy, they’ll have to explain that they didn’t want to go to jail. If you are a 13-year-old with a younger sibling, however, police say they will give you a pass. But this leads to an entirely different problem. How, exactly, police would enforce this law remains a mystery as the children will be in costume and they are also children. Will the unusually tall kids under 13 years old be profiled and forced to show ID? How will the kid show an ID if they are 12 and don’t have one? It is laws like this one that epitomize the problems and hypocrisy with the state. The state claims you must be 21 to drink, 18 to be in the military, younger than 13 to go trick-or-treating, and all those in between are out of luck. If you disobey these laws, you risk being kidnapped and thrown in a cage. And this is what Halloween now looks like in the land of the free.